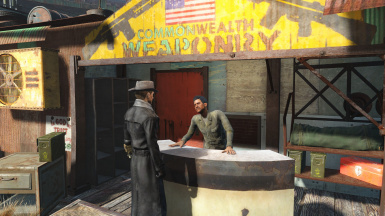 In a first of its kind for Fallout 4, this mod lets you save your entire loadout, including armor pieces! 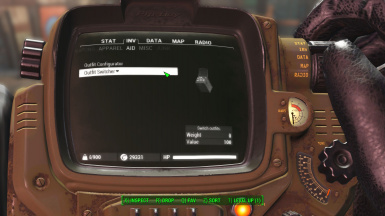 Then equip and swap between saved loadouts with the press of a button. You don't even need to open your Pip-Boy! It's like favorites, but entire loadouts at a time. ShadGirl Defrosted Recommended for instantly switching outfit collections. Where am I Instantly switch outfit collections, Battle,Trader,Builder,Rad Protect. New: Ability to rename loadout activators. Existing users, please craft new loadout activators at the Chemistry station. Instead of "Loadout 1" you can now rename your loadout to something like "Fancy Glasses Outfit" or "Armor Overlay". New: Ability to exclude loadouts from the loadout cycler. New: Armor overlays and toggling! You will now have a new option to set a loadout as an "overlay" loadout, and optionally make it an on-and-off toggle when activated. Overlays do not unequip your other pieces of equipment, meaning that you can now store just your bandana, eyewear, and other "add-on" items and they'll be equipped right onto whatever you're already wearing at the time. Toggle mode also means that if you activate that overlay again, it will unequip the overlaid items. Overlays are great for addon pieces (eyewear, masks) and armor pieces, as well as headgear, allowing you to toggle your headgear and other accessories on and off anytime with any loadout. You can access these new options via the new Loadout Options menu item. To save an overlay, set the Overlay mode to On in Loadout Options, equip just the items you want to have in your overlay, then hit Save Loadout. Fixed issue with full-body outfits that also occupy the headgear slot (i.e. Hazmat Suit and Hooded Rags) being auto-unequipped in third-person. Completely re-written from the ground up and compiled with the Creation Kit. Now standalone and has no master dependencies. You no longer need to specify which slots you want to place equipment in, nor do you need to select each individual piece of equipment you want to store into a loadout. 2.0 is able to automatically detect everything you have currently equipped. If updating, you NEED to make a clean save before installing 2.0. To do this, remove 1.0, load your game, then make a save without the mod installed. Copy to New Loadout command to create a new loadout based on an existing one. Smart glove handling - now gloves won't stick around between loadouts. Support added for slots 48, 49, 50, 54, 55, 56, 57, 58, and 61. Hotkey activation - cycle between loadouts. Prepare your wardrobe. Store up to twenty outfit loadouts! Five dedicated outfit switchers to immediately switch to your desired outfit loadout. Change outfits in real-time without pausing the game. 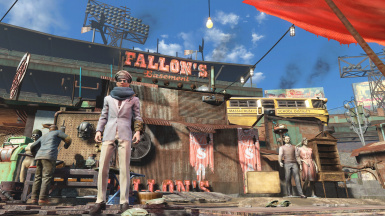 In a first of its kind for Fallout 4, this mod lets you save your entire outfit set, including armor pieces! Then equip and swap between saved outfit sets with the press of a button. You don't even need to open your Pip-Boy! It's like favorites, but entire loadouts at a time. Always wearing the same thing because of the hassle of changing? Downloaded all those rad clothing mods from the Nexus but end up only wearing one all the time? Annoyed that you'd have to fill up all your favorite slots to have even one outfit equipped on-the-fly? Perhaps you'd like to walk around town in more comfortable wear, and gear up when you leave. Or perhaps you just want some variety. Outfit Switcher takes the pain out of searching through your inventory to equip your helmet, your left arm armor, your right arm armor, your chestpiece, your left leg armor, your right leg armor, that pesky Vault suit that you have to scroll down all the way to find... you get the drift. After installing the mod, you will receive two items in the Aid section of your Inventory - Outfit Switcher and Outfit Configurator. Assign the Outfit Switcher item to a favorites hotkey of your choice. That hotkey will cycle through your saved outfits. Five dedicated outfit switchers are available to craft at the Chemisty Station, under Utility. They are named Loadout 1 to Loadout 5 and can be renamed at the Armor Workbench. When activated, they switch directly to those outfit loadouts. First, equip whatever pieces of equipment you want saved into a loadout. Then open Outfit Configurator. Choose Save Loadout to save your currently equipped pieces into the loadout shown in the Config. 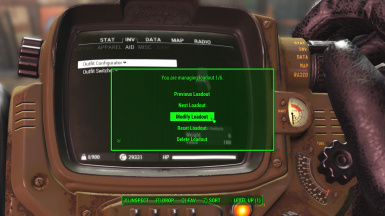 Please wait until you receive the Loadout Saved message before exiting your Pip-Boy. I highly recommend using Outfit Switcher with FO4 Hotkeys! You'll be able to hotkey any loadout to any key. Download the hotkey package from the Optional Files section to automatically put Outfit Switcher's hotkeys into your Hotkeys.ini file. If you wish, you can even bind loadout-switching to your mouse wheel while the Shift key is held down! Variants of a unique item can only be assigned to a single loadout! This means that you can't hotkey light combat armor and heavy combat armor to different loadouts. Variants have the same ID and are indistinguishable, so the mod won't be able to tell them apart. The game will always load the set that you last equipped if you store variants in different loadouts. Compatible with all equipment, even those added by mods. Modifies zero forms - won't conflict with any other mods! 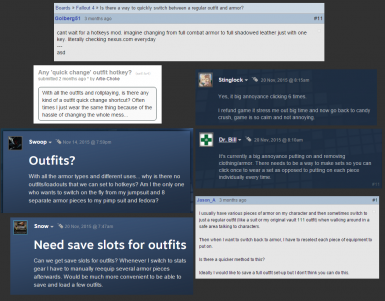 You are free to place Outfit Switcher anywhere in your load order. Advanced users can access advanced features via the console. Example: Display notifications when switching loadouts. NB: The Configurator always shows your active loadout number if you need to check which loadout you've just activated. Example: Copy the contents of Loadout 4 into Loadout 1, overwriting Loadout 1. NOTE: The following commands are only in v2.2 and up. Example: View what's in loadout 1. Made possible by FO4Edit and the amazing Caprica compiler.